There are 8 item(s) in your cart. 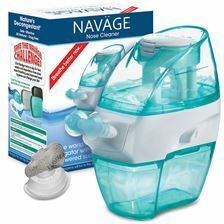 The Naväge Countertop Caddy is the perfect solution for having your Naväge Nose Cleaner and SaltPod Capsules always at the ready! It keeps everything neat and organized – and allows the device to air dry between uses. There's room to store over a dozen SaltPods in the convenient, removable tray. Made of the same attractive, high-quality material as the Nose Cleaner. Looks great on any vanity! The Naväge Travel Case is designed to keep your Naväge Nasal Hygiene System safe and snug when you travel – and look great too! With enough space for the Nose Cleaner and a dozen SaltPods, you'll have everything you need for a weekend getaway or extended trip. 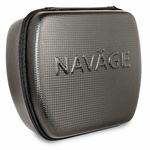 The hard case protects the SaltPods from bumps and bruises when you're on the go, and the soft interior keeps your Nose Cleaner from getting scratched in transit. The convenient handle makes it a cinch to grab and go! Copyright © 2019 RhinoSystems, Inc. All rights reserved.